And here's my main 'large' project 'Hero - Celestial Force' which is a fangame of sorts to 'Hero' by Daniel Remar (check his site on my links list). Graphic style is somewhere between NES and SNES and it has an original NSF soundtrack by my music buddy Technomancer. 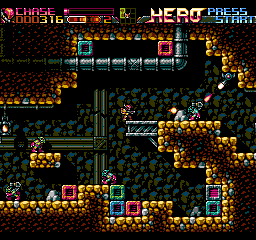 The gameplay is sort of a mix of Metroid and Robotron I guess. Here's a new screenshot of the current build in action. Celestial Force looks really great! I'm impatient - exists any chance try afla/beta/demo version please? Thanks for reply.